Remember that important drawing or document you deleted from Buzzsaw a few weeks ago? Well sure enough, you need it back........it seems that it was your only copy. That would never happen, right? Unfortunately it does. So how do you get the file back? Just go to the recycle bin, find the file, right click on it, and select "Restore". It goes back into production.............it's been restored to active status on your Buzzsaw site. Easy enough. But what happens when you delete a file from Buzzsaw, and someone empties the Buzzsaw recycle bin? It's not there to restore. Gone forever right? Not necessarily. Your Buzzsaw Site Administrator may be able to get the file back for you. The rule of thumb is, you have 30 days or so to get files back after they have been emptied from the recycle bin. And with a phone call to Autodesk, you may be able to get files back that were deleted several months ago. There is probably going to be a lot of activities logged here. We'll apply a filter by pressing the List Options button. There are 3 windows showing, you want the Actions window. 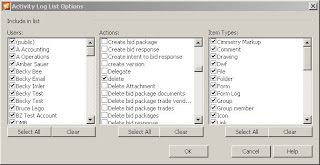 Select the Clear button below the Actions window. Then scroll down the listed action and check the delete box. 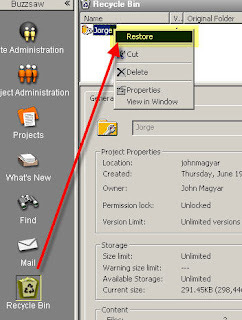 We are now looking at only the actions of items being deleted (Folders, Projects, Files, Business Processes, etc). 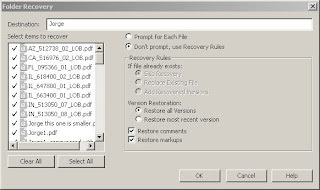 Find the item that you want recovered, then select the Recover Selected Item button in the lower left part of you window. If you are restoring a project or folder, you can restore all of the files within it, or have Buzzsaw ask you which files to restore. Buzzsaw will also allow you to restore all versions of the file you are recovering, or only restore the most recent version of it. And lastly, you can choose to restore comment tied to the file that you're recovering..........and/or markups associated with the file. Now that's a great tool when you need it. Recovering items that have been emptied from the recycle bin isn't something that we do everyday. It's that one time though.......that we REALLY need something back that this feature comes to save the day.